At Crandon Park for the Miami Open, Serena Williams is in her kingdom. To be the best, you have to beat the best. When Serena plays her finest tennis, that quote resembles barely possible mission to accomplish. In semifinals battle that lasted over 130 minutes we have seen one of the most intriguing matches this season so far. In collisions of styles and tactical brilliance between Serena Williams and Simona Halep, it was just a matter of time when one of these two ladies will have trouble dealing with enormous pressure in this high intensity match. Finally it was Williams who past this three set challenge against feisty Romanian player who came marginally close upsetting the World No 1. 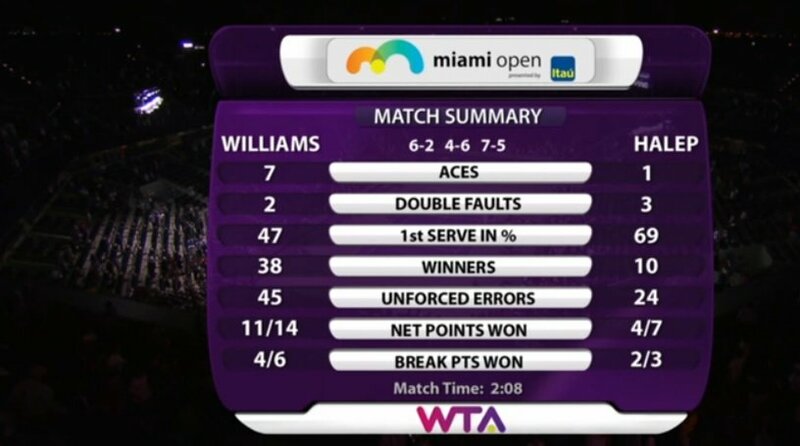 However, the 6-2 4-6 7-5 score in favor of Williams wasn’t close enough for getting a spot in Miami Open finals. Williams had 38 winners against 10 for Halep and she was the player that raised the stakes when it mattered most. Halep, the fresh Indian Wells champion, and World ranked No. 3, is now 1-5 against Williams with her single victory coming in a round robin match in Singapore at last year’s WTA Championships when she shocked the world with dominating 6-0, 6-2 victory, only to lose to Williams a few days later in the finals 6-3, 6-0. Williams played for her eighth Miami title against the 12th-seeded Carla Suárez Navarro, who cruised past Andrea Petkovic in other semifinals pair with a convincing straight sets win 6-3 6-3. It was a first final appearance in Premier 5 series for 26 year old Spanish player. Right from the start, it was a perfect matchup for Serena Williams. In affair that lasted barely 56 minutes, Serena produced dominating performance to seal the victory with 6-2 6-0. Williams won the match with 27 direct points in her winners column. After opening score 2-2, Serena never looked back making a run of winning twelve consecutive games. Suárez Navarro won only two points on her serve in the second set, while Williams won 21 of 22 points on her first serve. “I would like to dedicate this to my dad, he’s not here. I miss him, I hope he’s watching. I love you dad and this one’s for you.”, Williams said. “It feels really good to have eight titles here under my belt. I’d like to believe the older I get, the better I get,” she concluded. The American had to pull out of her semi-final in Indian Wells last month, because of a knee injury, and there had been doubt over her participation in Miami. For Suarez Navarro it was a fifth straight defeat against Serena but she wasn’t disappointed. Following next week she will be ranked as a Top 10 player for the first time. 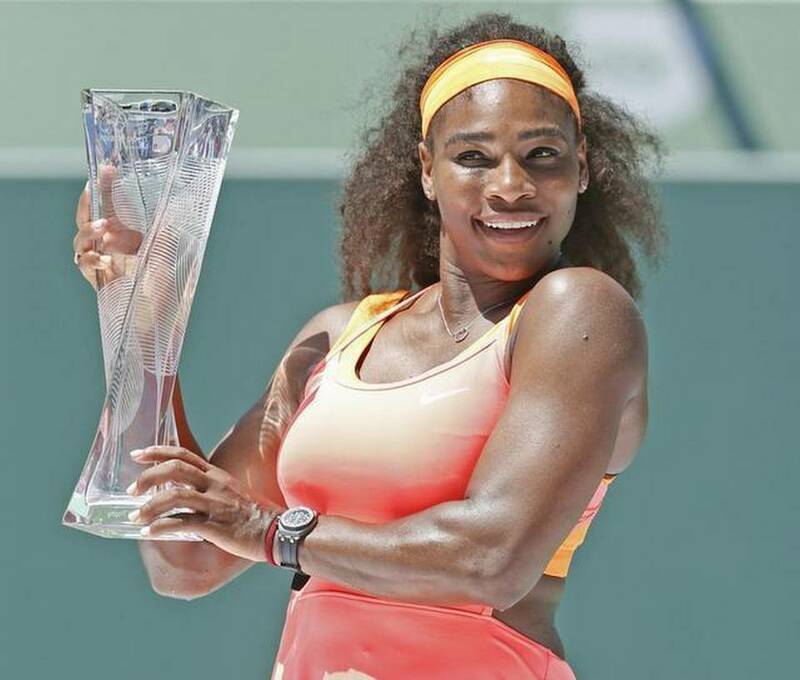 Williams, a 19-times grand slam champion, marked a total of 66th WTA tournament win. It was all smiles for her at Key Biscayne after breaking the number of 700 wins in her professional carrier and with this form she has every reason for optimism at following start of clay court season in Europe.